Momentum is a gorgeous studio re-imagining of new music performed by David Wright at his USA Gatherings concert in September 2007. At times like Vangelis at his most serene and then with tingling sequences reminiscent of Schulze’s ‘Crystal Lake’, David’s music and performance that night garnered many plaudits. David states; “I felt inspired by a beautiful, intimate venue and an appreciative audience who were really into the music. Such combinations raise the adrenaline levels and result in an energy and spontaneous creativity that is rarely achieved in the studio”. The gently evolving, journey style offering is laced with atmospherics and underpinned with gentle percussion and sequences that builds rhythmically as the album progresses. There is a beauty and timeless nature to the music, creating moods and weaving sounds to create a sonic tapestry, a seamless flowing journey. The two 35 minute pieces are split into 13 parts with interlinking themes that hold the listeners attention from beginning to end and stylistically, follows the trend set with recent epic tracks like “Cassini”. 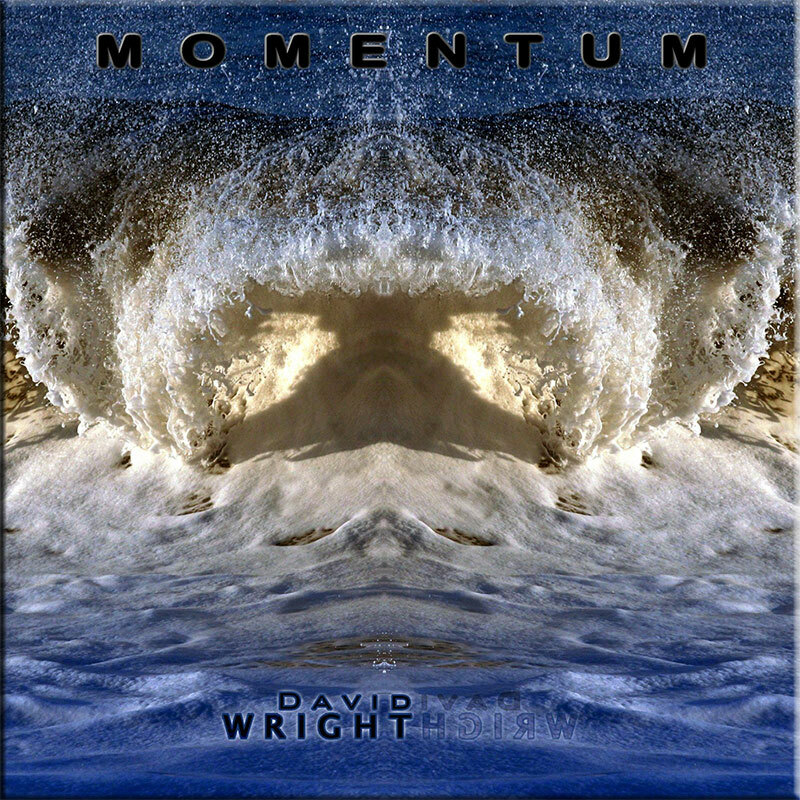 Momentum contains all the best elements of David Wright’s music and is sure to find favour with existing fans and anyone who enjoys high quality electronic music. This is David’s 18th album, recorded at his USA Gatherings Series Concert in September 2007 and finished in the studio. The result is a very attractive album, with two flowing 35 minute tracks, split into 13 parts. The music stays in typical Wright-style, similar to “The Tenth Planet”, or the song “Cassini” from the album “Continuum”, or even “Sea of Dreams” from “Deeper”. Additionally, there are shades of Jonn Serrie and an occasional hint of Vangelis’ Blade Runner. The first part “The Gathering” opens with speaker trembling bass and loud thunderclaps leading into the moody “Desire” (part 1) with gorgeous drifting synth sounds playing a beautiful melody. In “A Solitary moment,” the third part of the first long track, gentle rhythms and sequences slowly build and morph into “Panic Attack” an experimental excursion similar to a sci fi movie movie. And the following “Emergence” is again a mixture of “Blade Runner” and typical David Wright, which after a few minutes develop into the almost Ashra like sequences and guitar of “Out of the Blue” – with a melody line that made me tingle with its beauty before floating into the close with a gentle reprise of Desire. The second long track begins with wave noises from a vast seascape that leads into “Secrets In The Mist – Part 1”. This opens with a gentle melody that floats on a gentle rising synth pad before changing into “Evolution” with its great rhythm underpinned by a hypnotic and effective bass line. 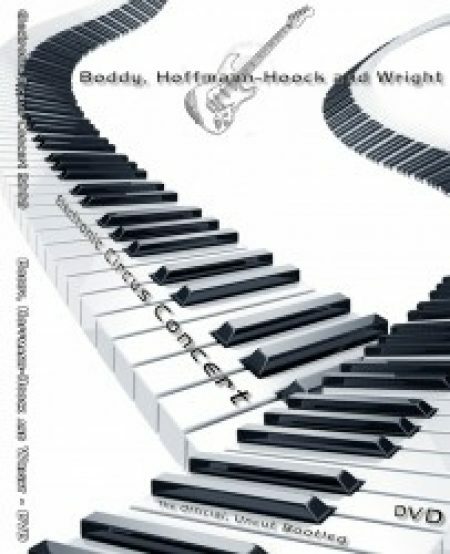 The music moves forward with the impressive “Momentum” parts 1 to 3 with great piano lead, mood and melody throughout. The epic closes with a reprise of “Secrets in the Mist” and already I feel the need to press the start button on my CD player! “Momentum” is an impressive release and though the year is young, “Momentum” is already a highlight in the field of electronic music. Beautiful harmonies and gentle rhythm passages help make “Momentum” a top space music album. The seed of this album was a mainly improvised concert David did as part of The Gatherings series in the States. It was a quite inspirational performance but unfortunately because of technical issues the tapes were not usable. David therefore treated it as a studio album of all new material, putting right what needed ‘fixing’ but as far as possible keeping the original ‘key structure, development and mood’. A very quiet solar wind effect is joined by a deep bass rumble then explosive thunder claps, reverberating into the night sky. All this provides a rather dramatic start for what is basically the introductory and appropriately titled track ‘The Gathering’. Things calm down substantially for ‘Desire – part 1’. Little note droplets fall onto lush tranquil pads, enough to soothe the most stressed mind. A slow peaceful, faintly ethnic, rhythm starts up as we flow into ‘A Solitary Moment’. A beautiful melody floats above it all seeping into the very soul. The pace increases a little and a plucked string acoustic guitar type loop bounces wonderfully off the original melody- quite exquisite it all is too. Again we flow into the next track (all the first seven numbers seamlessly progress from one to the next) ‘Panic Attack’ but instead of the rather frantic music I was expecting we again return to deeply atmospheric tones and effects- I know it is an overused term but ‘cosmic’ really does fit the bill here. A similar rhythm to that found on ‘…Solitary Moment’ appears on ‘Emergence’ and another delicate little melody drips like water gently landing on a mirror lake. Another lovely guitar type loop gives that little extra oomph as we continue through to ‘Out of the Blue’. ‘Desire- part 2’ is basically a reprise of the first part, in other words as chilled as it is possible to get. We pause before entering what is effectively the first track on the second half of the album, ‘Secrets of the Mist – part 1’. The sound of a calm sea breaks onto a peaceful shoreline. A brass type melody calls out like the sun rising above the horizon (even had a bit of a Spaghetti Western feel to it!) then ethereal pads float from the speakers like an early morning mist burning off the water. ‘Evolution’ introduces a tinkling sequence like heat shimmers over a scorched landscape. A second sequence and driving rhythm really pick up the pace as we enter the most forceful passage on the album so far, that lovely laid back brass melody still shining above it all. A bass line with real attitude adds a contrasting bight. Wonderful stuff! We now enter the three-part title track, still in quite a groove, the main addition being more wordless ethereal vocal effects. A stunning lead solo adds an even greater element of class. This album just gets better and better! ‘Part 2’ calms things down again with the return of water on shore but now all rather eerie and melancholy. Another excellent bass line can be heard then a ticking rhythm adding a little structure as things become more syncopated but with a wonderfully moody edge. As we move into ‘Part 3’ a piano lead is added which softens things a little but there is still a sense of determined purpose here that will not be diverted from its path. A second absolutely corking lead takes turns with the piano which itself responds and becomes even more inspired. Absolutely fantastic! ‘Secrets in the mist – part 2’ provides a spaced out and moodily melodic atmospheric finish. I would say that after the incredible ‘Walking with Ghosts’ this is my favourite David Wright album. 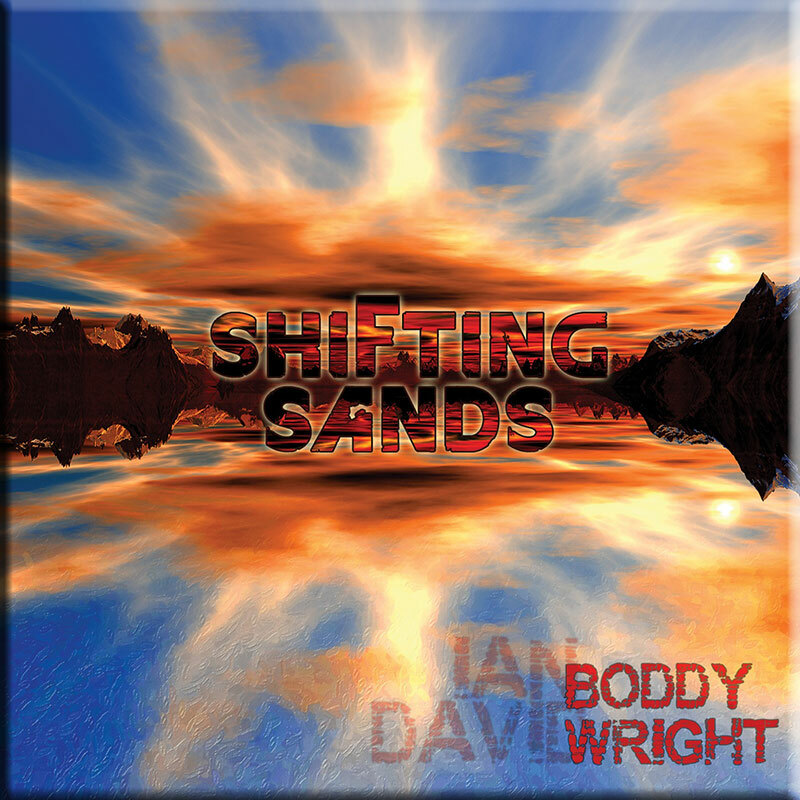 David Wright is a highly capable musician, and his craft shines through brilliantly on this superb CD. From a labeling perspective, this CD is divided into 13 tracks. From a listening perspective, however, most of the tracks flow together, creating a relatively seamless listening experience. The effect works well, and the listener is taken on an almost uninterrupted journey, during which several common themes evolve, dissipate, and then re-emerge throughout the recording. The first track, “The Gathering”, comes to life with a sudden burst of thunder, which continues to crash and roll, eventually morphing into the second track, “Desire (Part 1)”. It is in this second track where we begin to hear a core theme of the album, which is also the basis of tracks 3, 5, 6, and 7. The music here is incredibly beautiful, and filled with warm, sweet passages that are delicate, sweeping, and sparkling. The feeling is uplifting, buoyant, and contented, seeming both earthy and spacey at the same time. The only point at which this mood is broken is within the fourth track, “Panic Attack”. Here, the sound turns darker, foreboding, and devoid of melody. The passage into, and then out of this darker piece, however, is very effective – almost as though a short storm has interrupted a gorgeous day, and when the darkness passes and the brightness returns, all beauty is returned. The break between tracks 7 and 8 is the only occurrance where actual silence separates two adjacent songs, and could possibly be viewed as the “midpoint” of the album. It is here that the light, sweet “theme” found in most of the first 7 tracks disappears, and is replaced with different but equally rewarding sounds that are at times quite ambient and tranquil, and are at other times rhythmic and even danceable. Track 8, “Secrets In The Mist (Part 1)”, begins with the sound of ocean waves against a soft bed of electronic drone. Spacey, interjected noises begin to emerge, and a sound evoking a haunting, mournful horn finds a place in the mix, completing this mysterious segment of soundscape. These same sounds spill over into the initial portion of track 9, “Evolution”, but the mood gradually shifts, once again, as a delicate rhythm emerges and then strengthens as the song progresses. This same energy continues into track 10, “Momentum (Part 1)”. Track 11, “Momentum (Part 2)”, drops to a quiet and non-rhythmic intro, but once again, the rhythmic elements return, and this same pulse continues through track 12, “Momentum (Part 3)”. Track 13, “Secrets In The Mist (Part 2)”, ends the CD as a wonderfully ambient composition, low in energy and absent of rhythm, mournfully fading out (the haunting “horn” returns) into the returning sounds of the ocean. This is a truly fine recording of electronic ambient music, presenting several contrasting moods which are woven together very effectively. I’ve listened to this CD many times since first discovering it at at the radio station where I work, and subsequently purchasing a “home” copy for myself – which has gotten extensive “air-time” in both my house and my car. Wright packs about 70 minutes of music, made up 13 tracks, into the album. The tracks flow into each other, forming two larger sections. The music ranges from ambient music and environmental sound to percolating downtempo electronica. Throughout the album, Wright explores beautiful, complex electronic sounds. But, while much of the music is mellow and relaxing, Wright avoids the trap of getting overly sweet. Two tracks on the first half of the album, Desire – Parts I & II, are so gently and lushly orchestrated that you just want to wallow in the sound of it. But Wright also skillfully weaves in sections like Panic Attack that are edgier and darker. While the first half of the album leans more towards symphonic electronica, the second half contrasts ambient pieces like Secrets In The Mist with the more driving, modern synth music sound of Momentum. While I hear shades of Blade Runner era Vangelis on this album, especially on tracks like Panic Attack and Momentum 3, Wright’s own distinct voice shapes the entire release. Momentum builds on what Wright’s done previously, but it also moves his music forward, with some of his most sensual music ever. The music has beautiful melodies and lush sounds, but they are balanced with surprises in his arrangements and sounds that border on noise. I really like David Wright’s Momentum – to my ears, it’s his best release yet. I’m going to try and resist a track by track run through of MOMENTUM because I’m fairly sure I would soon run out of superlatives to describe the beauty and timeless nature of the music. In the sleeve notes David’s style is described as being about; “Creating moods, weaving sounds, textures sequences and rhythms to create a sonic tapestry, a seamless flowing journey”. This is certainly true of ‘Momentum’ which finds David Wright at his most relaxed and harmonious. The music originates from a largely improvised and well received performance at the 2007 ‘Gatherings Concert’ in Philadelphia, USA. Due to some technical difficulties, it was not possible to record the entire performance as a ‘live recording’, so ‘Momentum’ is a live album that has had a few studio tweaks and some re-recording, particularly in the second half. The basic themes and moods as experienced at the concert remain, and the album is essentially an emotive and wonderfully free-flowing composition. The first half opens with distant rumblings and ominous thunderclaps gradually developing into a beautifully fragile and tranquil peace, highly evocative of Vangelis at his most serene. Gentle, hypnotic rhythms develop and simply draw you into another world as they ebb and flow through atmospheric, spine tingling crystalline passages. Subtle, wordless female vocals are added to the mix as the first half moves towards climax before returning back to the opening theme. The second half is even better, opening with seductive waves washing on a far away beach, a haunting synth lead is heard in the distance. This is beautifully restrained and fragile, almost achingly so. A tingling sequence, reminiscent of Schulze’s ‘Crystal Lake’ emerges from this tranquility into one of those enticing and totally mesmerising percussive sequences that David does so well. Symphonic strings accentuated by more wordless female vocals and a stunning synths solo ride over the rhythm like an albatross soaring across the sky. After a brief and melancholy respite, the earlier sequence returns, this time enhanced by a poignant piano lead. All too soon soon, although it actually about nine minutes, the rhythms fade and we are left back on that far away beach currently reaching for the replay button. This is definitely one for fans of Walking with Ghosts. 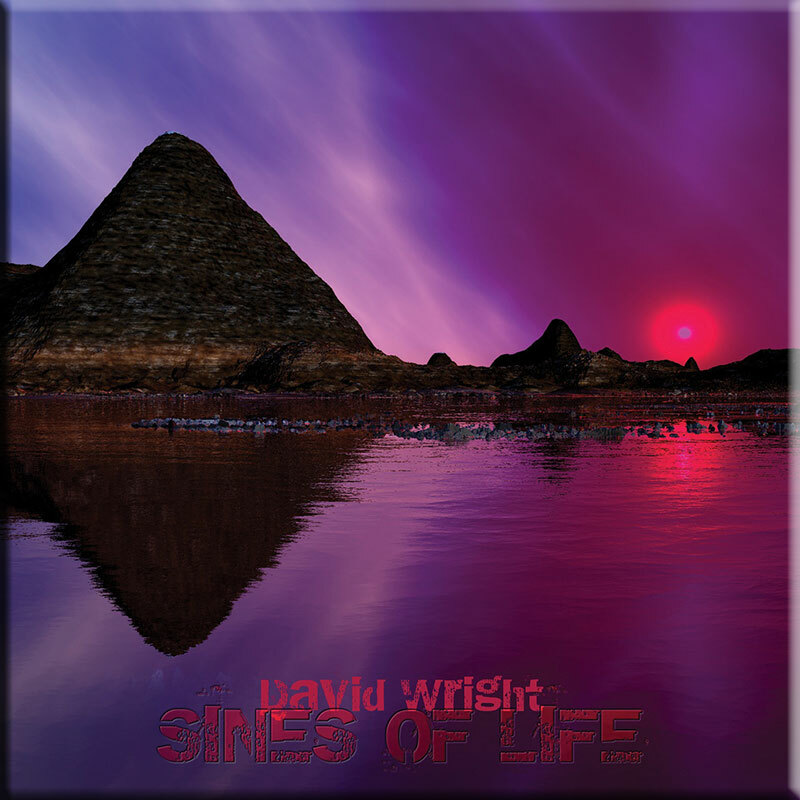 In this album, David Wright retakes some aspects of the sweetest side in his personal style, which can be found in several of his early CDs, and he now offers us a work of a quite romantic nature, mostly flowing through the streams of Melodic Ambient, while at the same time including some touches of Atmospheric Pop with a deliberate rhythm. The CD consists in two long suites, each one divided into several parts.The music is ideal to isolate yourself from your surroundings and allow your mind to freely fly towards wherever imagination or emotions that each passage evokes may take you.